So far this year geopolitical developments have been having a significant impact on investment markets. Most of these revolve in some way around President Trump and the US: with the threat of a trade war between the US and China (although “constructive” talks between the two add to confidence that a trade war will be averted); the Mueller inquiry concerning his campaign’s links to Russia (but like many such inquiries seems to be looking at other things too); the US decision to reimpose sanctions on Iran (and a resultant rise in oil prices); and recently (mostly) good news regarding North Korea. Away from the US the other major geopolitical risk on investors’ radars at present concerns Italy. Last year the big concern was that the 2016 Brexit vote and Trump victory presaged a surge in support for populist Eurosceptic parties in elections in the Netherlands, France, Germany and Austria and that an independence vote in the Catalan region of Spain would also pose a threat, all contributing to increased risk of an eventual Eurozone break up. In the end no such thing happened. 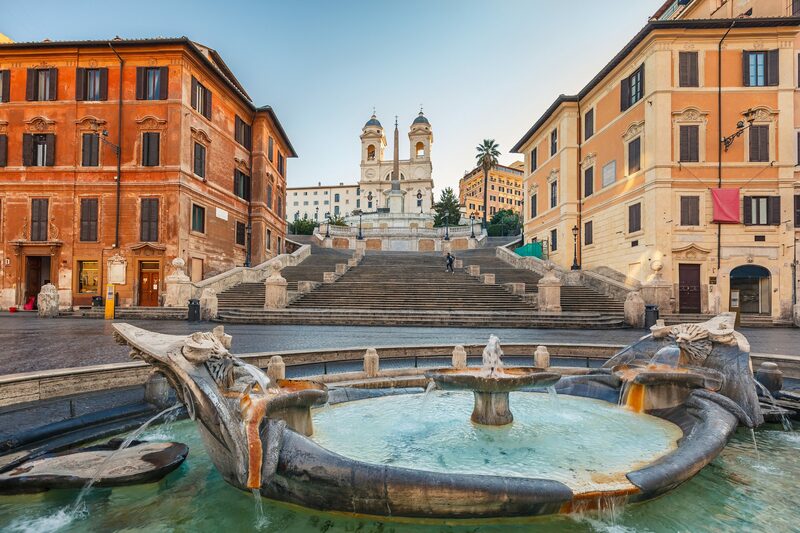 This year the concern is that the formation of a populist coalition government in Italy with Eurosceptic leanings will drive crisis in Italy and potentially threaten the Euro. I must admit that while I wasn’t worried about last year’s Eurozone elections the risks around Italy are greater. But a break up of the Euro triggered by Italy still looks very unlikely. And in the meantime, Eurozone shares remain attractive. This note looks at the main issues. While the populists did not fare as well as many predicted in Europe last year the populist left-leaning Five Star Movement (5SM) and populist far-right Northern League (NL) were the big winners in the Italian elections in March. While neither won a majority on their own and a coalition between them was seen as the worst possible scenario given their background of Euroscepticism and support for irrational economic policies, despite their political differences they have agreed to do just that. They are proposing amongst other things: big tax cuts (with just two rates of 15% and 20% for companies and individuals); a basic income for the less well off; a roll back of pension reforms; and a review of European Union budget rules. The resultant budget deficit blow out will create tensions with the EU at a time when Italian public debt at around 130% of GDP is the second highest amongst Eurozone countries and its budget deficit at around 1.6% of GDP is the third highest. Source: IMF, AMP Capital. Note: Greek public debt looks worse than it is as Eurozone assistance has lengthened its maturity at very low rates. Which in turn risks significant upwards pressure on Italian bond yields. Northern League leader Matteo Salvini has naively bragged that “The spread [between Italian and German bond yields] is going up – do you remember the spread?”. Investors do and the gap between Italian and German bond yields has risen by 0.63% this month so Italy now pays 1.85% more than Germany to borrow for 10 years. 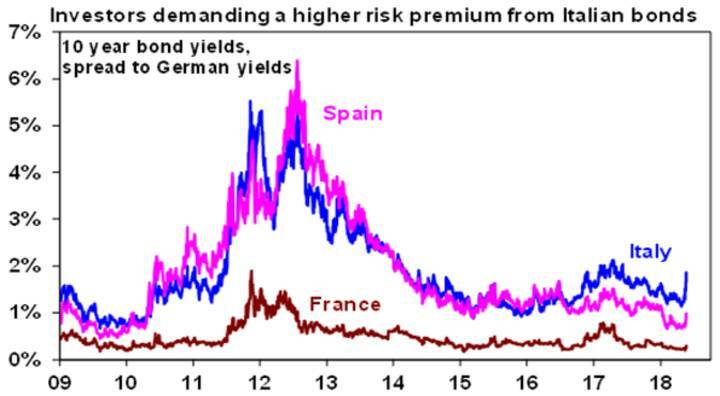 This has put some upwards pressure on Spanish and Portuguese bond yields, although none are near the extremes of the 2011-2012 Eurozone crisis. This is also now weighting on Italian shares which after being outperformers over the last year as the Italian economy improved are now down 3.7% this month. 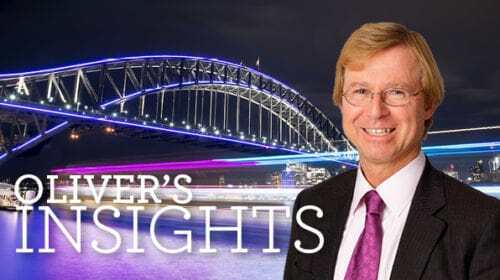 Market and economic realities may eventually force 5SM and NL to water down their policies in government – which may explain why the leader of neither wants to be PM! In some ways this has echoes of Syriza in Greece that once promised extreme populist policies and an exit from the Euro but became just another centrist European political party. 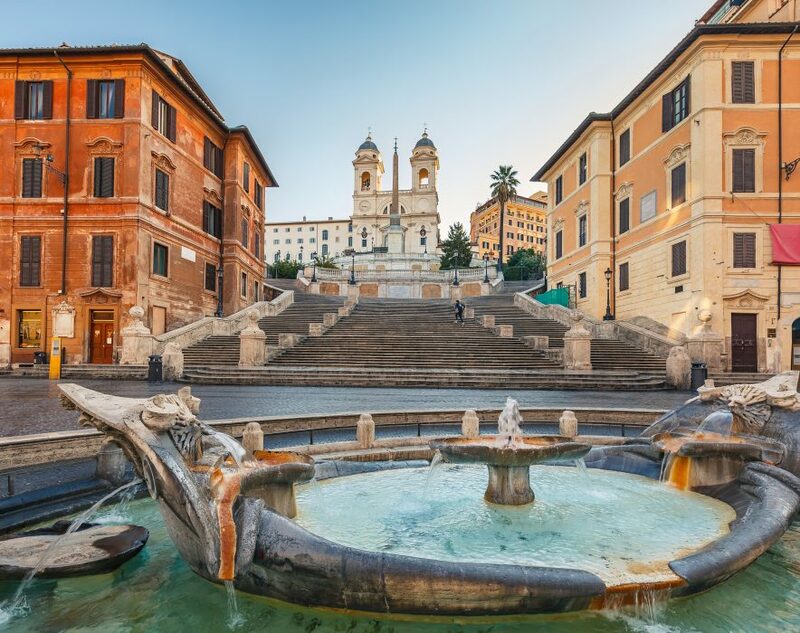 So it may turn out to be a non-event but it could still impose significant risk along the way (as the noise in Greece did) and suggests a cautious stance towards Italian assets – particularly shares and bonds. 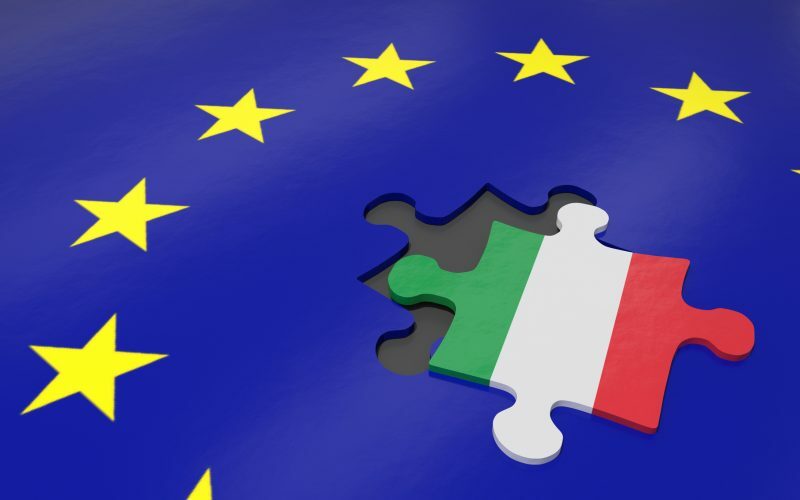 Given 5SM and NL’s background in Euroscepticism an Italian push for an exit from the Euro (Itexit) could emerge as an issue when Italy and the Eurozone next have an economic downturn. However, there are three reasons not to be too concerned about an Itexit and contagion to the rest of the Eurozone. 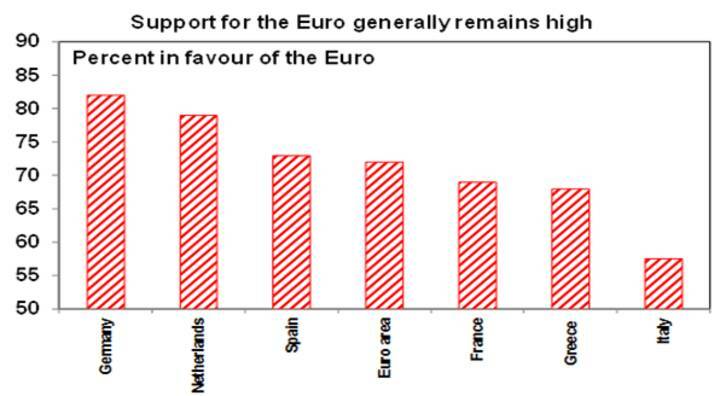 First, its not an imminent threat in Italy because while support for the Euro there is not as strong as it is elsewhere in the Eurozone, a majority of Italians support the Euro (with support actually rising from a year ago) and 5SM and NL only did well because they backed away from policies to exit the Euro. Second, as Syriza and Greece have found exiting the Euro is easier said than done and would involve: currency redenomination; a probable sharp collapse in the value of the “new” Lira; a run on the banks, capital flight and a sharp rise in Italian bond yields as depositors, individuals, companies and investors try to move into harder currency; harsh fiscal austerity as funding for Italy’s 1.6% of GDP general budget deficit would evaporate; and a return to recession. This would likely see a 5SM/NL coalition government back away from an Itexit before it went too far – just as we saw Syriza do. popular support for the Euro is solid at around 70% across the Eurozone and various countries showed by their elections last year they aren’t interested in exiting the Euro. ​While a break up in the Euro is unlikely, a populist coalition in government in Italy, which is the Eurozone’s third largest country, along with a deterioration in its budgetary position will keep fears of a threat to it alive (after they subsided following last year’s elections) and this will weigh on the Euro. Particularly in the short term until investors get a clearer handle on what a 5SM/NL coalition government in Italy will do. While question marks remain over Italy and this will weigh on the Euro, there is good reason to be optimistic regarding Eurozone shares. 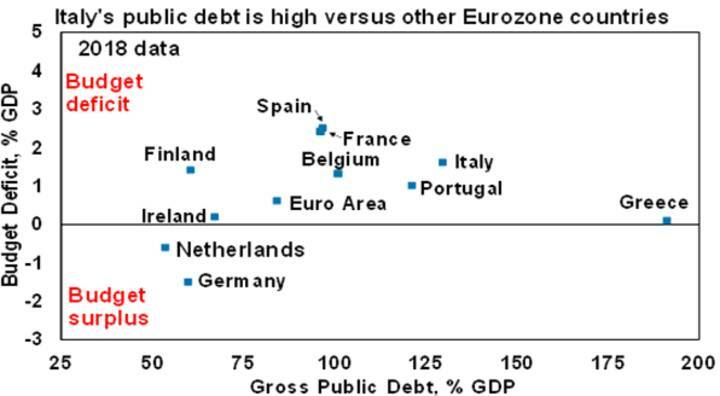 First, Eurozone shares are not expensive. They are trading on a price to forward earnings multiple of 14 times which is around its long-term average. 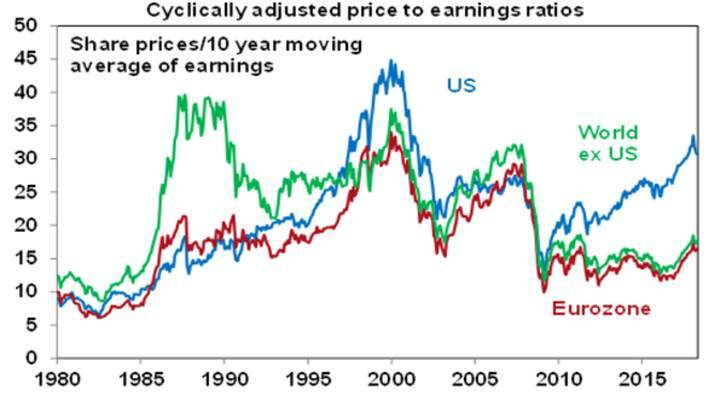 And their cyclically adjusted price to earnings ratio which compares share prices to a ten-year moving average of earnings (often called a Shiller PE) is around 17 times compared to 32 times in the US. This is largely because Eurozone shares underperformed US shares in the post GFC period. Adjusting for relatively lower bond yields in Europe makes Eurozone shares even more attractive. Second, the European Central Bank is still pumping cash into the economy and is a long way from rate hikes. Italian risk may keep it easier for longer. This contrasts to the Fed which is engaging in quantitative tightening and raising interest rates. Third, the Euro is now falling. A rise in the Euro through last year – as Eurozone growth surprise on the upside relative to the US and political risk declined in the Eurozone relative to the US – harmed Eurozone shares. This is now reversing as US growth has started to accelerate relative to the Eurozone. 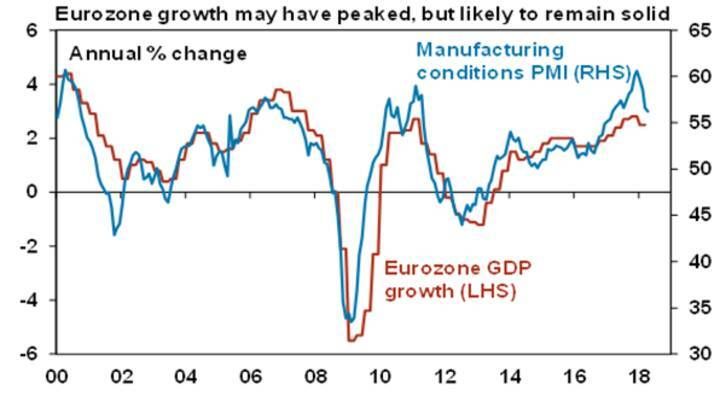 Finally, while Eurozone growth has slowed a bit it’s still good and thanks to ongoing monetary stimulus and a now falling Euro is likely to remain so. In turn this is good for profit growth. There are several implications for investors. Firstly, a populist coalition government in Italy is negative for Italian assets. Second, it’s another drag on the Euro which along with relatively easier monetary policy and slower growth compared to the US is likely to see more downside against the US dollar (which probably means it tracks sideways against the $A). Finally, Eurozone shares are likely to be relative outperformers notably versus US shares thanks to more attractive valuations, easier monetary policy and a falling Euro. Original Source: Produced by AMP Capital Ltd and published on 22 May 2018. Original article. Next PostDon’t fall for it – who can you trust with your money?